Bronze Sculpture, Bronze Fountains & More | Metropolitan Galleries Inc.
Backorders require a 50% deposit. Prices are subject to change within 30 days. Orders require payment in full prior to release of merchandise. Company Check, Master Card, Visa, American Express, and Discover are all accepted. Shipping & Handling charges are nonrefundable and must be prepaid. If you require a lift gate and unpacking services, the cost will need to be added to the sale. 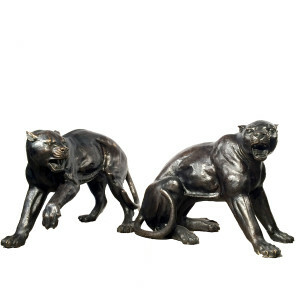 Metropolitan Galleries Inc. offers several different pricing programs to meet its wide customer base for our superior quality bronze statues and fountains, marble statuary and wrought iron. Designer pricing is reserved for any individual of company established in the design trade. Pricing discount is also available for hospitality groups, recreational and educational facilities. Dealer pricing is reserved for any stocking dealer. For Consideration as a stocking dealer, Metropolitan Galleries Inc. requires evidence as to the nature of Business. Contact our corporate office for more information about becoming a dealer for bronze statuary. Bronze Statue foundries, shipping schedules and customs delays have the posibility of change without prior notice. Therefore, delivery time slots are estimates and are not guaranteed. Metropolitan Galleries Inc. works very closely with our bronze statue foundries and strive for accurate container arrivals. Title to merchandise shall pass to the buyer on delivery by Metropolitan Galleries Inc. by Freight Line carrier. Transit time can vary depending on your location from our corporate office and warehouse. When you or your 3rd party consignee signs for your merchandise from the carrier, the product must be inspected at that time. If your order is damaged in shipment, please hold the merchandise, the package it came in, and notify us and the shipper WITHIN 5 BUSINESS DAYS or your claim cannot be honored. Metropolitan Galleries Inc. is not responsible for any damages or defects occurring 30 days after purchase. Bronze Statuary requires proper Care & Cleaning to maintain its brilliance. 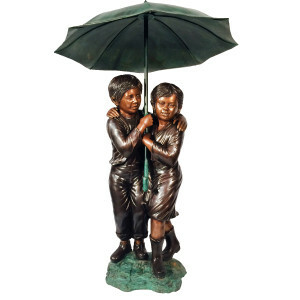 Bronze statues naturally age with time and grow a beautiful patina. This look is often desired, however some prefer the hand applied finish that their bronze statue was fraught with. Metropolitan Galleries Inc. is not responsible for the natural aging of bronze statuary. Container Discounts are available for 20’ and 40’ containers. All container Pricing includes ocean freight and door delivery. 50% Deposit is required for all container orders. Metropolitan Galleries, Inc. issues credits only. All Bronze Statuary, Marble Statuary and Wrought Iron quotes are valid for 30 Days.